We work with young people aged 11+ years on youth issues and healthy lifestyles, offering a safe environment for young people to chill out and participate in recreational activities. These staffed drop-in sessions provide facilities for pool, table tennis, and a youth café and create a safe and friendly environment for young people to interact and socialise, encouraging participation and providing alternatives to drink and drug abuse and improve anti-social behaviour. 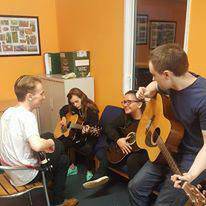 We host weekly music sessions for children and young people aged 9-16 years including drumming and guitar lessons which improve self-confidence and self-esteem and enhance co-ordination, concentration and creative skills. To find out more about any of these activities contact a member of the PASP team on 01236 426 737 or email info@parentactionforsafeplay.co.uk.